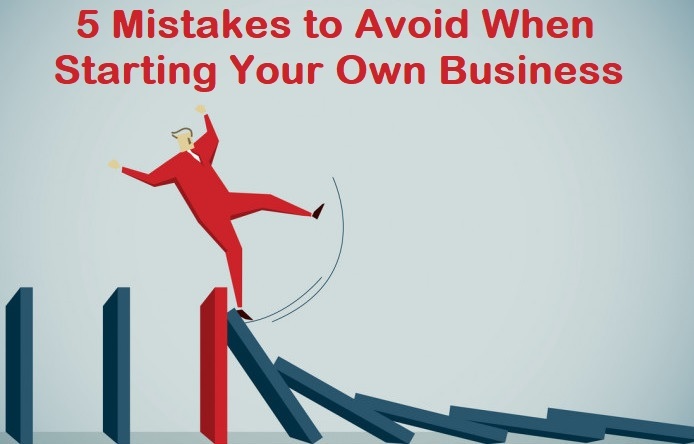 Entrepreneurs are more aggressive and optimistic than normal individuals, but they still need to be careful not to make certain basic mistakes which can ruin their business overnight. Along with passion and courage, you should have the knowledge and vision to lead your employees in the right direction. Running a business can be really challenging and business owners are always looking for ways to improve their business. Customers are of prime importance for any business and every customer expects that their concerns and feedback are listened to by the people with whom they are doing business. If you let your customers become a simple file in your database and start ignoring their complaints, your business is certainly doomed to fail. You should appreciate the feedback given by their customers and make them realize that you value their current and future business. Once your business gains traction and you start growing and getting new customers, you should not ignore the existing customers and their valuable feedback. Improving customer experience should always be the topmost priority for any business. Not listening to customers and responding to their queries and concerns promptly are the biggest blunders which can ultimately destroy your business. Almost every business founder complains about the fact that it’s very difficult to hire the right candidates and retain them for a longer period. Especially for start-ups and small businesses, it can be really challenging to find talented people as they don’t have an established brand and also can’t afford to pay huge salaries like bigger corporations. Some businesses have failed terribly because they hired too quickly just to fill the vacancies. Companies which fail to choose the right people who have good knowledge about the company’s business will never be able to sustain. If a business chooses quality over quantity to get more orders, then it may likely not get repeat business from existing customers. Sacrificing the product quality just to meet the delivery deadlines is one of the costliest mistakes that any business can make. Customers are very smart nowadays and they can instantly realize the drop in quality. They will soon move to other businesses which offer similar product/service at a better quality. Ultimately, your future business depends on how well you maintain quality and how well you listen to and make changes in your products/services based on customer feedback. If you think short-term and work just to meet your quarterly sales goals and profit targets, your business may not achieve greater heights. Any modern business requires the use of IT devices in their workspace which includes Desktops, Laptops, Tablets, Smartphones, networking products like routers, switches, Wi-Fi Access points etc. Even a very small business or start-up will require at least a workstation with internet connectivity. Businesses which fail to safeguard their electronic devices from security threats including hackers, malware, viruses and DoS attacks are at greater risk of exposing their customer data. There have been massive data breaches in recent times such as the cyber-attack on the credit firm Equifax where hackers gained access to the company’s resources and stole the personal data of 145 million users. Another big security attack which took place in 2017 was the breach of 3 billion user accounts of Yahoo. Hence, you should not take cyber-security lightly and you should install reliable antivirus software like Bitdefender to protect your network and devices from malware such as Viruses, Trojans, worms, Ransomware etc. If you compare Bitdefender with Norton, it is more powerful and has won awards both from independent testing labs and multiple online publications. It offers the best protection along with unmatched performance without hogging your system resources. Another big mistake which businesses do is not paying attention to the competitors and not improving their marketing strategies. The markets and customer expectations keep changing constantly. You should upgrade your marketing strategies to stay ahead of the competition and get the right attention from your target audience. If you pay close attention to your competitors in the market, you can better understand current trends in the industry, which can help you to find out new ways to promote your product. Businesses who fail to stay ahead of the competition will slowly fade away as they will start losing their existing customers.